The Persian Gulf map was in large part chosen to act as the setting for DCS: F/A-18C Hornet combat operations. Operate from numerous, detailed airfields in the UAE and Oman or from the deck of a Nimitz-class aircraft carrier. Conduct air-to-air and air-to-ground operations over a huge, detailed portion of southern Iran and many of the Persian Gulf islands. New additions coming to the map in time for the pack include the SA-2 and Rapier surface-to-air missile system, the HY-2 Silkworm anti-ship cruise missile, the Aldar Headquarters building, the Sheikh Zayad Grand Mosque, and oil platforms. More map items like new airfields, unique buildings, and weapons will be added after the Pack. The Su-33 adds a great adversary aircraft for the Hornet. We are also offering on Steam a bundle of just the Hornet and Persian Gulf Map for just $79! Hornet and Persian Gulf Map Discounts Reinstated! Last week we offered a special deal in which you could get $20 USD off the Hornet if you already own the Persian Gulf Map, or $10 USD off the Persian Gulf Map if you own the Hornet. We are listening, and due to popular request, we are re-instating this deal until 21 October 2018! For those that already own one of these two modules, we hope you’ll take this opportunity to try the other. Unfortunately, Steam is unable to offer this same deal. This past weekend we ran our first Free Weekend, and we are ecstatic with the great reception! The Free Weekend was a great way for many of you to experience the great quality and value put into the Hornet, Persian Gulf Map, and Su-33, and we hope you’ll consider making a purchase. Given the success of the Free Weekend, we certainly plan to do more of these. It’s a great opportunity for you to try before you buy. Due to both an Open Beta and Release version of DCS World being released last week to support the Free Weekend, there is no update for this week. However, on 10 October we will release the updated MiG-29 Fulcrum for Flaming Cliffs 3! This will include a Professional Flight Model (PFM), updated cockpit, and several new cockpit system functions. This will be a FREE update for Flaming Cliffs 3 owners! For those that do not own Flaming Cliffs 3, we will also make it available as a separate purchase. 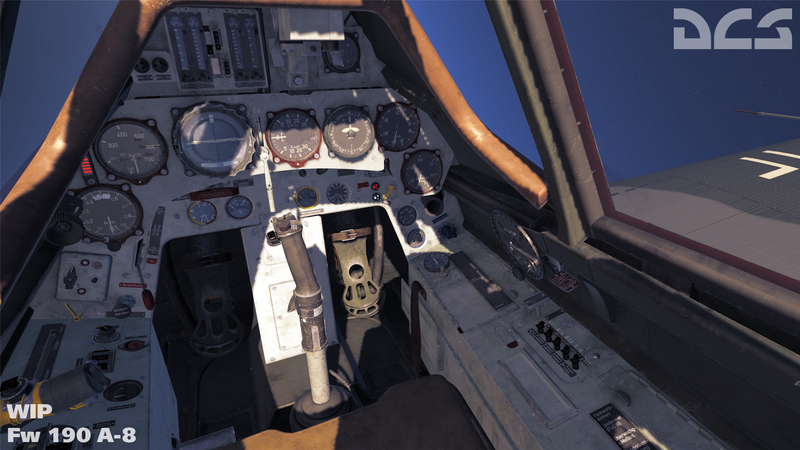 Next week will also see new improvements to the Hornet, such as the air-to-air radar performance. DCS: Fw 190 A-8 Coming to DCS World! Our next warbird coming to DCS World will be the Focke-Wulf 190 A-8 Würger (Strike) of the German Luftwaffe. Designed by Kurt Tank in the 1930s, the Fw 190 was a single seat German fighter powered by a powerful BMW 801 radial engine. When first deployed, it provide largely superior to its main rival: the Spitfire Mk.V. This in turn led to the development of the Spitfire Mk.IX. We look forward to some great online dogfights between the Fw 190 A-8 and the Spitfire Mk.IX! Capable of both aerial and ground attack missions, the A-8 model entered production in February 1944 and included thicker armor and improved engine design. 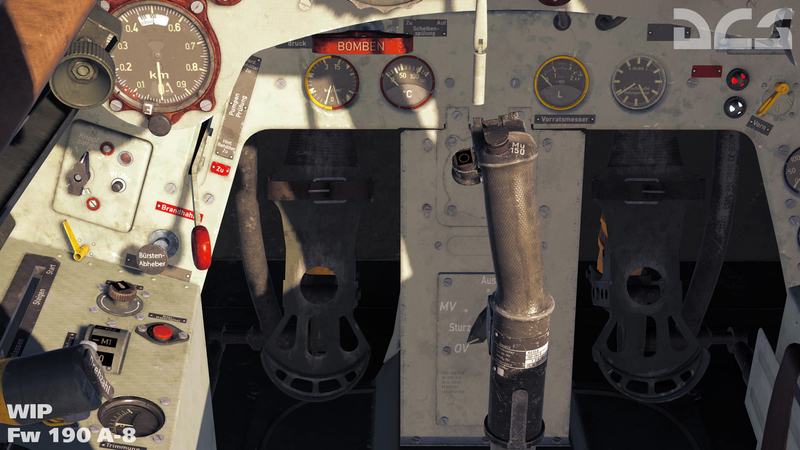 We see the “Butcher Bird” as a great addition to the stable of DCS World War II aircraft and will be a perfect fit for the Normandy map! In parallel, work on the P-47D is progressing well on both art and creating the flight model based on virtual wind tunnel data.